His Majesty King Hamad bin Isa Al Khalifa today at the Safriya Palace received the Daily Tribune Responsible Editor, Chairman of Arab-African Organization for Human Rights, Captain Mahmoud Yusuf Al Mahmoud, who presented HM the King with a copy of his book titled (King of humanity… Human rights in the Kingdom of Bahrain), which focuses on HM the King’s leading role in humanitarian fields and Bahrain’s achievements in human rights fields in the prosperous royal era. HM the King lauded the author’s effort to prepare the book, highlighting Bahrain’s distinguished human right’s record based on advanced constitutional and legal texts, noting the noble values of coexistence, equality and pluralism enjoyed by the Bahraini community throughout history. He praised the contributions of Captain Al Mahmoud to human rights, press and media, wishing him more successes to come. 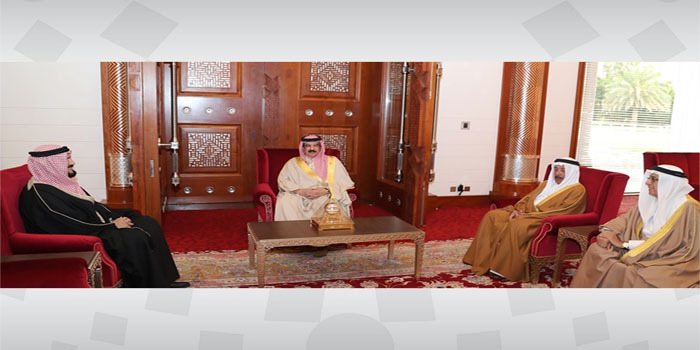 HM the King paid tribute to the national aptitudes’ achievements in various fields and forums, which accentuate Bahrain high standing at the local and international levels. Al Mahmoud expressed appreciation of HM the King’s support for Bahraini aptitudes who aim to promote Bahrain’s global standing.